" . . . I am a door opener. My specialty consists of opening doors that have been shut tight . . . some have been sealed shut and boarded over. Some have been secured with steel bars . . . I am a specialist. I am a door opener. I am a praying man." Since writing the insightful Incredible Answers to Prayer series of books, Roger Morneau received thousand of letters and telephone calls from all over the world. People are eager to experience the powerful blessings of intercessory prayer put into practice in their own lives. Roger Morneau was a man of of incredible faith. When he prayed, things happened. In this exciting DVD, Morneau shares the counsel he's offered hurting men and women, and relates thrilling stories of God's intervention. 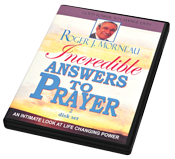 In these captivating DVD's, Morneau shows how you can walk more closely with God, share His power and love with others, and receive incredible answers to prayer.